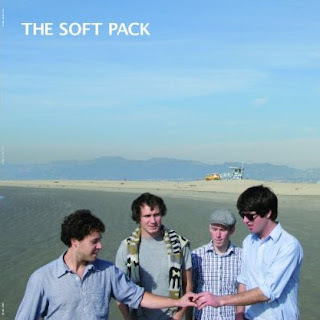 The Soft Pack finally released a “debut” full length this month, and it's about time, seeing as they've been performing under this name since not long after their first and last record as The Muslims was released. In those last couple of years they've shifted over to Kemado (current home of Langhorne Slim! ), switched up 50 percent of the band (bass player Dave Lantzman and drummer Brian Hill – the latter of whom just may be the best drummer in L.A.), and have made the transition from San Diego to Echo Park. And, hell, they're getting some nice features now, like this one the L.A. Times wrote up on their effort to tour ten Southern California stops in a single day, in promotion of this new record. So, the record. It's really bleedin' good. All this stuff about Modern Lovers this and Velvet Underground that is sort of out the window – actually, scratch that. It's like variations on “Someone I Care About” to fill the length of an LP, but more deadpan than silly, thanks to Matt Lamkin's delivery (and mother of god, the Times referred to such as not unlike Charles Grodin, perhaps scarily and accurately). There's not a lick of filler on this record, which, due to Hill's brilliant energy, is more retro punk than easygoing surf rock, as had been the case with the first Muslims album. The best part about these songs is that they're even better live. This is a very sloppy review that says little. Apologies. Just listen to the stuff.